The 40 foot high hydraulic accumulator tower is located between the main line and Gloucester Avenue on the north side of the canal. 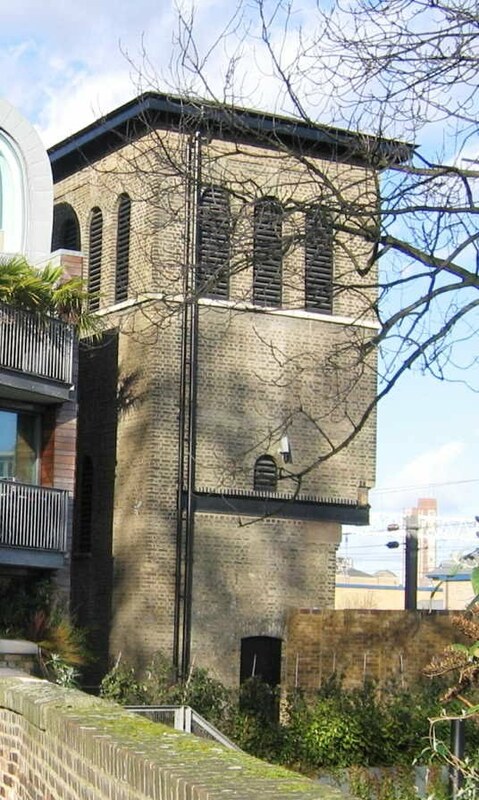 It was built as an “additional accumulator tower” in 1866 to supply water under pressure to Camden Goods Depot’s hydraulic systems, principally hydraulic cranes and capstans. It is the oldest of a handful of LNWR accumulator towers to survive. The location of the original steam engine driven pumping house is uncertain, but the later pumping station, now demolished, was just north of the tower. The lower part of the tower was altered to accommodate a new rail track around 1912.